This formation evolved when the depression between the Cordillera Domeyko mountain range and the main Andean mountain ranges, filled by an ancient salt flat, was squeezed together over the last 10-15 million years, leaving behind the folded belt of hills seen today. 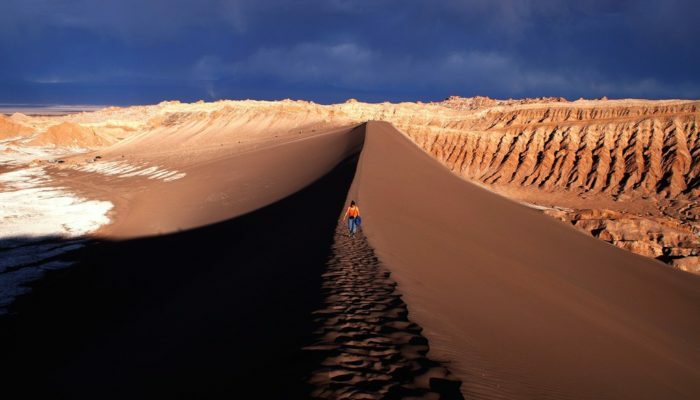 Sand brought along from adjacent areas by the winds was caught between the ridges of the Cordillera de la Sal, accumulating to form the impressive dune shown in the foreground of the image. Under normal conditions, the perfectly shaped Licancabur Volcano, forming the border between Chile and Argentina, would appear in the background of this sunset scene. However, the image was taken during the Invierno Boliviano (Bolivian winter), when humid air from the eastern side of the Andes travels west across the Andean Plateau, Altiplano. The air masses journey all the way to the otherwise extremely arid Atacama Desert, bringing clouds, rain and occasionally even hail. I have been to this area three times: first for vacation, then two times for excursions with students, most recently in February this year. Interestingly, the weather was as to be expected for the Atacama Desert only one time. For the two other times, the weather was looking like this photograph, so it is hard for me to believe that the Atacama would be as arid as people always say. However, indeed, the pieces of geological and geomorphological evidence, such as the folded layers of the Cordillera de la Sal, clearly indicate its extreme aridity, prevailing for tens of millions of years!